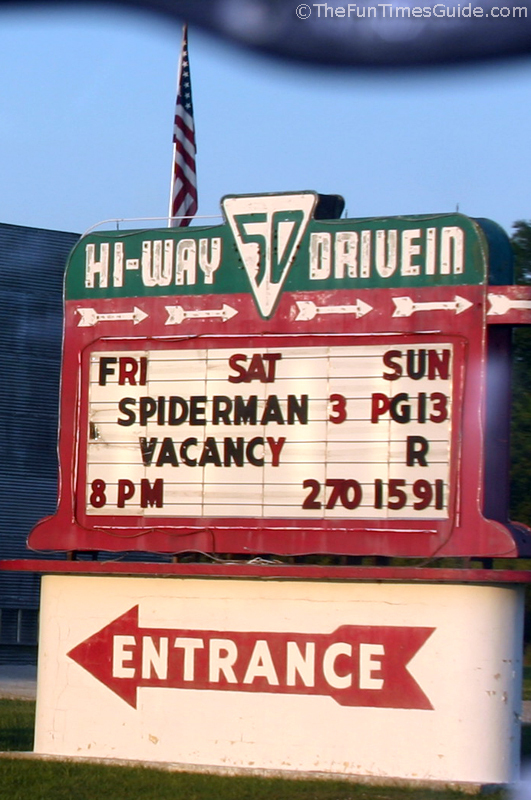 The Hi-Way 50 Drive-In in Lewisburg, Tennessee is a single screen drive in theater that first opened in 1946. Jim and I went for the first time last night. We saw Spiderman 3 and Vacancy. At the Hiway 50 Drive-In, you always get a double feature for just $7 per person. If you’re from around here, then you may have heard that the Hi-Way 50 Drive-In experienced a fire in the Control Room and the Concession Stand in March of 2007. For awhile, the owners, Gary & June Douglas, were unsure as to whether they would be able to show movies at the Hiway 50 Drive-In anymore. Fortunately, thanks to donations and their ability to repair or replace much of their equipment, they were able to reopen in a matter of weeks. 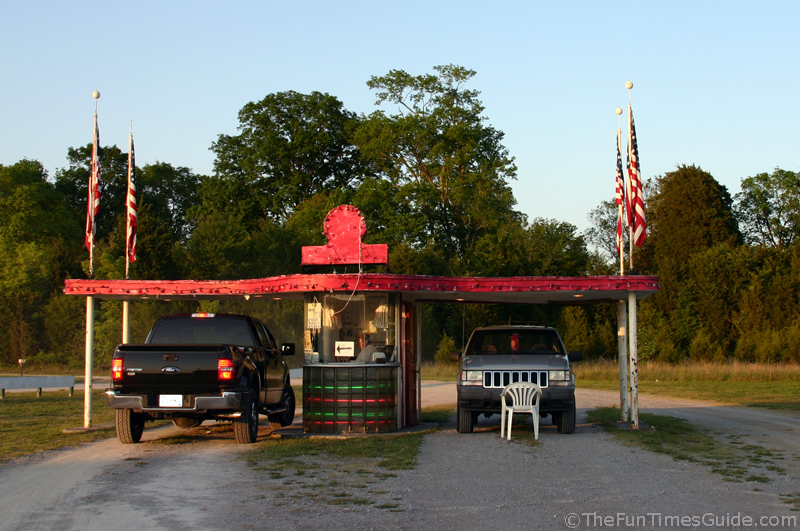 UPDATE: The Hiway 50 Drive-In has new owners now, and they’ve made a lot of great changes! We had a lot of fun last night! We’ve only been to one other drive-in together. It was 2 years ago — at the Pink Cadillac Drive-In on Highway 100 in Centerville, Tennessee. The place was packed. I guess everyone was eager to see Spiderman 3 (ehhh) then Vacancy (surprisingly good… especially at a drive-in). We parked in the 3rd row, right in the middle. It was perfect. Since there’s only one screen, and it’s a pretty small one, you want to get there early to get a prime parking spot. One thing I noticed… When half the cars left after the first movie (which is typical at drive-ins — especially when the first movie attracts a lot of kids), I had a harder time blocking out the passing cars on the highway that runs behind the movie screen. I guess all those SUVs filled with kids were serving as peripheral-vision-blockers for me. I’m kind of a stickler for “distractions”, so at the drive-in, I do everything in my power to block out extraneous sights & sounds. (There was also a barking yippy dog on this night.) Once all the cars left, I had to huddle down low in my seat, so the Jeep’s doors bocked most of the side views. Then I propped my pillow up higher than normal between the seat and the door. Then I turned my baseball cap just so… to block out the last little corner that I kept seeing cars’ headlights in. And, just like last time, we draped an old map down over the glowing light from the Jeep’s clock/radio. They had really good popcorn! It was just like “real” movie theater popcorn …even the butter. Mmmm! They also had some pretty cool drive-in movie T-shirts they were selling for just $10. I got one! Here’s our list of things to take to a drive-in movie. 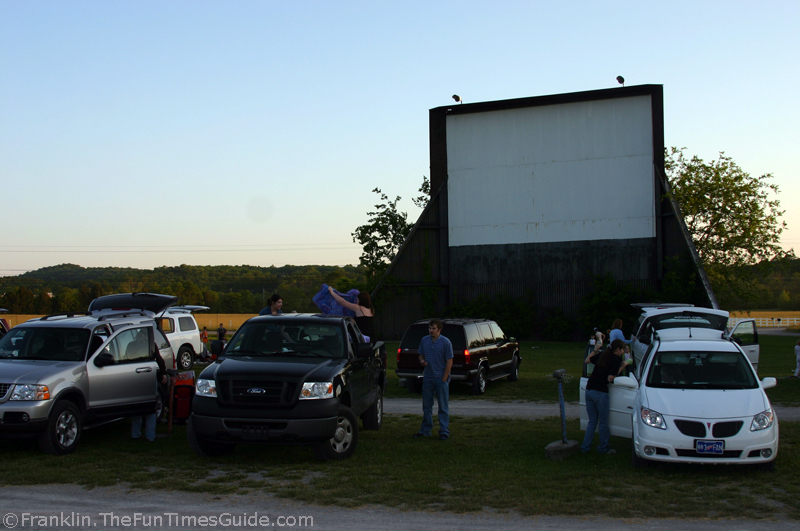 If you live around here, then you’ll want to check out these other drive-in movie theaters in Tennessee as well. See at a glance what the upcoming movies at Hiway 50 Drive-In are going to be via their Facebook page.